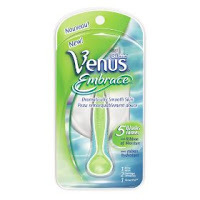 I tried the Venus Embrace razor today for the first time ever. What a treat! Usually, I use whatever razor was free, cheap, or about to be thrown out by my husband (but still had some “cutting" power left). Yes. I’m THAT cheap. I have always said there are few products I would consider paying for. (As in PERIOD!) The Venus Embrace may have just helped me change my mind. I still would not pay full price for this razor any more than I would for any other razor. However, I might consider paying $1 after coupons &/or rebates; for example. This is the smoothest shave I have ever had! At first, I tought the razor wasn’t shaving. It was THAT soft of a shave. You really can’t even tell it’s shaving you-until the hair is gone! It didn’t think a razor could ever impress me. The Venus Embrace has proved me wrong. The HUGE downfall to this razor is the price. At an average cost of $13.99 for the razor and $27.99 for eight refills, one must fork over a pretty-penny to buy this DISPOSABLE razor! I just cannot swallow that; no matter how much I like the razor. with a coupon. Thankfully, Gillette is always very generous with their coupons. THAT is something I can wrap my wallet around. I just wish it were more affordable in the first place, though. I can’t imagine it costs THAT much to produce this product. Price notwithstanding, I would recommend this razor to any woman looking for the best shave they’ve ever had. I would think this would be a good “starter” razor for a pre-teen just starting to shave as well.